The Nissan Juke's appearance in the compact crossover segment has spurred several other automakers into fielding their own entries. Three years on from its debut, Nissan has refreshed its quirky offering for 2014--though fuel economy remains unchanged. 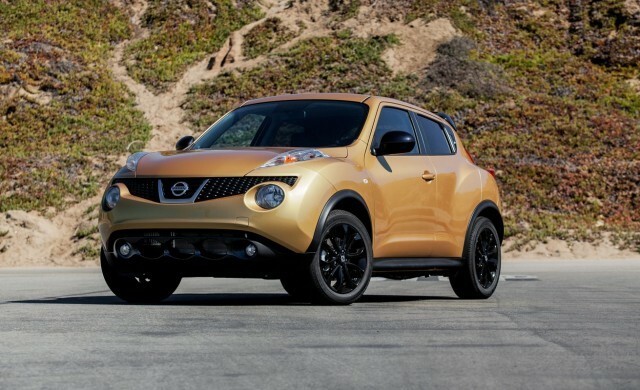 All Juke models get a 1.6-liter turbocharged gasoline four-cylinder, producing 188 horsepower and 177 lb-ft of torque. If you want a manual transmission, you're stuck with front-wheel drive. Front-drive, CVT models are most efficient, at 29 mpg combined (27 mpg city, 32 mpg highway). Opt for the manual, and combined and city numbers drop by 2 mpg apiece, while highway mileage drops to 31 mpg. All-wheel drive takes another 1 mpg bite from your highway mileage, but combined and city figures match those of the manual car. The engine does gain Nissan's 'Puredrive' designation though, using features like a higher compression ratio and cooled Exhaust Gas Recirculation to improve non-greenhouse emissions. The unchanged economy leaves us little hope the Juke's disappointing real-world economy will improve either--particularly as the crossover class gets ever more efficient as a whole. A more potent Juke Nismo is also available, producing 197 horsepower. There's no word on economy, but the sporty Juke sits on 18-inch alloy wheels and uprated suspension, and gives crossover buyers a rival for MINI's Paceman and Countryman Cooper S models. In terms of styling, the Juke features the same love-it or hate-it form as before. Its character hasn't been diminished with the subtle tweaks, but its appeal for those who aren't keen won't have grown. The most noticeable exterior change can be found atop the hood, where the slim driving lights now echo those on Nissan's 370Z sports car. Redesigned bumpers and rear lights also feature. 17-inch wheels are standard, and a wide range of colors returns. Some of these exterior shades can be replicated on the interior center console, including the new Red Alert and Bordeaux Black shades. The I-CON system returns--letting drivers select between air-conditioning and drive mode controls using the same console panel--with its Eco mode to encourage frugal driving. As we found out on the car's launch in Geneva, Nissan has also liberated 40 percent extra luggage space in the Juke, helping to reduce one of the old car's main failings. Standard features include iPod compatibility, Bluetooth hands-free, while the list of available options is long--leather seating, a backup camera, Rockford Fosgate audio, keyless entry and a push-button start, navigation, SiriusXM satellite radio and more. The 2014 Juke starts at $19,980 for an S-trim with CVT. The cheapest manual car is the Juke SV, at $21,800. Nismo models start at $23,980 with (hurrah) a manual transmission, and rise to $28,930 for an AWD, CVT car. All prices include an $810 destination fee.